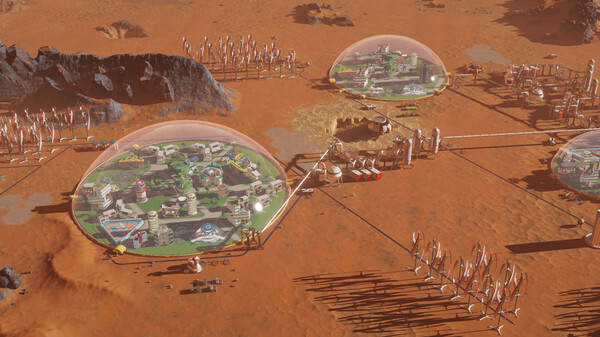 Two bits of big news for the survival city-builder Surviving Mars today, as the big free Da Vinci update is out and the next update named Sagan has been teased too. As we posted about before, the Da Vinci update adds in a new Creative Mode for those of you who like a much more relaxed experience. Giving you more funding, easier research, buildings that don't malfunction, much faster sector scanning, free construction of buildings and more. Additionally, you can now set the exact amount of resources that you wish to store in storage buildings and depots, the UI for this was also re-worked to make it a lot easier. When putting down a new building, it will automatically connect with wires to the nearest building that has power, preventing lots of micro-management with power cables. There's also a new camera feature to let you follow units on their travels. On top of that, there's plenty of balance changes, disasters have been adjusted to actually be more menacing and there's plenty more UI tweaks as well. Full patch notes can be read here. All Outta Luck - Face 30 new major challenges in separate playthroughs each with their own parameters for success, including: sponsor, commander profile, active game rules and map coordinates. If you wish to pick up a copy, you can from Humble Store, GOG and Steam.